These women of Jerusalem: following Jesus, likely to be in the role of those who lament the one being crucified. Jesus addresses them as the faithful and speaks of the struggles to come – both for himself, the women and the hearers of Luke’s gospel. Once again we hear Jesus’ words addressed to those whom he encountered but also those the writer is addressing. Imagine being one of the Jerusalem faithful. Look at the faces of the women in the painting and see concern and grief, exhaustion and fear; their poses show them looking at Jesus at the same time as shielding and protecting their young. The light around Jesus shines as an antidote to all the negativity and evil – even though he is on the way to his death. They seek his presence and, whilst they are supposed to be the givers of lament and he a receiver, the tables are turned. He is with them in their suffering. Still today, carrying the fear, grief, concern and hopelessness that is all pervasive in the struggles of the world, we can turn to Jesus, the light of the world, and find hope and blessing. The darkness cannot overcome the eternal light. Even in the most hopeless of situations, Christ is with us in our struggles – and his cross reminds us of this. ‘Come to me all you who are heavy laden and I will give you rest.’ Then and now. For eternity. Thanks be to God. 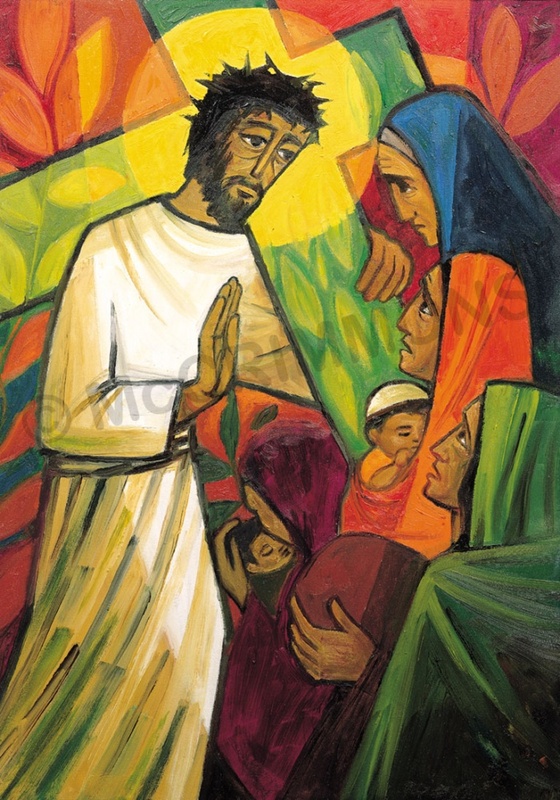 Picture: by the Sisters of Turvey Abbey sold by Mcrimmons in their Footsteps of Christ series. and our world as they were in your time. And bring light, love and hope in their place. The Rev’d Jenny Mills. Minister at Newport Pagnell URC and West End United Church, Wolverton.